Sao Paulo (AFP) - Brazilian supermodel Gisele Bundchen, who has reigned supreme on runways for two decades, is retiring from the catwalk to spend more time with her NFL star quarterback husband and their children. The 34-year-old blonde beauty -- the world's highest-paid model who has strutted her stuff for many of the top labels in the business -- will make her final sashay down the catwalk in Sao Paulo next month. "Gisele will focus on special projects and also spending more time on her number one priority: her family," her sister and representative Patricia Bundchen said in a statement. "She is already cutting back on catwalk appearances and will bid adieu to shows in her own country during the Colcci brand presentation at Sao Paulo Fashion Week." Bundchen posted a message to her Facebook page, thanking fans for their support. "Thank you for all the love. A kiss in your heart and have a beautiful day!!!!" she wrote. Speculation about Bundchen's future had been rife since media reports emerged last week indicating she would make her final runway appearance at the April 13-17 Sao Paulo event (SPFW), where she has been a fixture throughout her career. Bundchen -- who Forbes says has been the world's highest-earning model for the past eight years, with $47 million in earnings last year -- is expected to turn her focus to print ad campaigns. 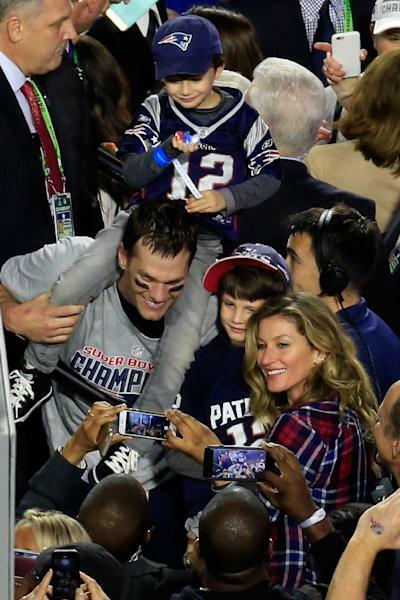 Bundchen is married to New England Patriots star Tom Brady, with whom she has two young children, Benjamin and Vivian. She has worked with the likes of Chanel, Valentino, Versace, Louis Vuitton, Alexander Wang, Balenciaga and Carolina Herrera. She has also many times been a Victoria's Secret "Angel". Bundchen said in a recent interview she wanted to spend more time with her US-based family. The supermodel often publishes pictures on social media showing her with her children. "Gisele appeared at the first edition of SPFW 20 years ago and it is an honor for us that she has chosen the same event to call it a day," event director Paulo Borges told AFP. "We are also very happy to see a Brazilian professional come such a long way with an extensive and respected career." With her willowy and athletic build, Bundchen built her success on sheer hard work as she kept up a strict and professional routine from the outset. Of German descent, she hails from the southern state of Rio Grande do Sul, home to many Brazilians of European extraction. "She has a great sense of professionalism. She knows how to make decisions, how to get involved. She treats everybody with respect and never arrived late for a commitment, neither in the early days, nor when she made it to the top," Borges reminisced. Bundchen started off her modeling career at the tender age of 14, and swiftly became a big name as major houses queued up to have her front their campaigns. Only recently, she signed her largest ever contract -- worth more than $25 million, according to Forbes -- with US sports apparel firm Under Armour. Bundchen has recently been promoting her own lingerie line, 'Gisele Bundchen Intimates,' launched in 2011 for Brazilian label Hope and told Folha de Sao Paulo newspaper in an interview that she planned to open her own boutiques. Bundchen manages her business affairs through a small family-based circle of confidantes and, magazine Epoca Negocios noted, she maintains "tight control over everything linked to her name and her image. "Her discipline and commitment to work have helped, for example, to avoid potential problems of unsuitable media exposure," the magazine said.